The Tucson is one of the most popular vehicles for the Hyundai brand. This compact SUV was first launched back in 2004. Thus, there are many second hand ones that are still in relatively good condition. One of the most important things about the Hyundai Tucson is the fact that it is much more competitively priced when compared to other similar models by other brands, such as the Ford Escape, the Toyota RAV4 and the Honda CR-V. The transmission varies from 4-speed automatic to the 5 and 6-speed manual. The 6-speed automatic options were introduced in 2009. Changes from one year to another were limited. They mainly included minor restyling and a few trim changes. 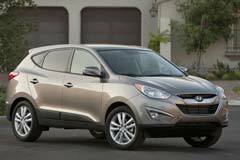 Other than that, Hyundai Tucsons do not vary that much from one another even though different versions were introduced throughout the years. It is worth pointing out that there was a lot of emphasis on the safety features. These include the Vehicle Dynamic Control, dual-stage frontal impact airbags, curtain airbags and torso side-impact air bags.